A key trait of successful businesses is their ability to quickly adapt to change. 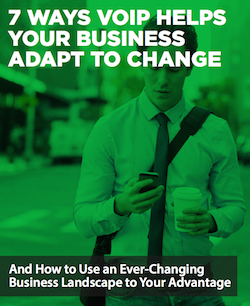 Adaptability allows you to take advantage of changing trends and differentiate your business in even crowded markets. As it turns out, one of the simplest ways to become more adaptable is to use VoIP. There are several reasons this is true - including lower costs, increased mobility, and faster decision making. Read our guide on the 7 Ways VoIP Helps Your Business Adapt to Change to learn more.